PBS Nature Animal Odd CouplesMost 'birds of a feather' flock together, but some, apparently, go astray - like the goose who befriends a tortoise and even protects the tortoise's nice fresh pile of veggies from the thieving intentions of other geese. The tortoise and the goose, the dog and the chimp, the lion and the coyote, and many more of nature's odd couples promise to provide hours of entertainment and insights this season in PBS Nature's new series Animal Odd Couples. This PBS preview of Animal Odd Couples gives you a glimpse of a few of these odd couples that have been discovered in zoos and animal sanctuaries throughout the world. Each couple has a story, a history, one more fascinating than the next, and PBS Nature captures these animals and their stories with superb photography and narration. Here's a great short video taken from the debut episode of Animal Odd Couples, where a male Pacific Brant goose takes a mysterious liking to a 45-year old female Aldabra giant tortoise. 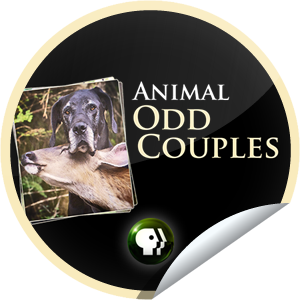 Animal Odd Couples premieres on November 7, 2012 (check your local PBS listings for times). The series uncovers the mysterious ways that animals of different species are attracted to each other, and animal behaviorists share their research and hypothesize about the emotions contributing to these pairings. This show is a must for all animal lovers!